In 1960s Chicago, a young woman stands in the middle of a musical and social revolution. A new historical novel from the bestselling author of White Collar Girl and What the Lady Wants. 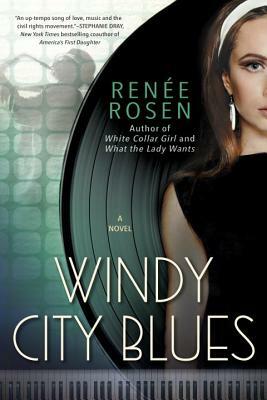 Leeba Groski doesn’t exactly fit in, but her love of music is not lost on her childhood friend and neighbor, Leonard Chess, who offers her a job at his new record company in Chicago. What starts as answering phones and filing becomes more than Leeba ever dreamed of, as she comes into her own as a songwriter and crosses paths with legendary performers like Chuck Berry and Etta James. But it’s Red Dupree, a black blues guitarist from Louisiana, who captures her heart and changes her life. Their relationship is unwelcome in segregated Chicago and they are shunned by Leeba’s Orthodox Jewish family. Yet in the midst of the Civil Rights Movement, Leeba and Red discover that, in times of struggle, music can bring people together. Renée Rosen is the bestselling author of White Collar Girl, What the Lady Wants, Dollface, and the young adult novel, Every Crooked Pot. She lives in Chicago.